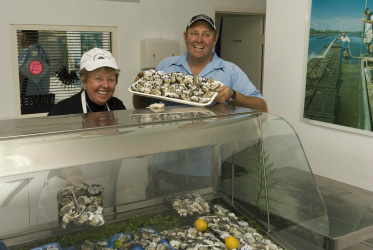 Holberts Oyster Supplies are Port Stephens leading oyster growing and processing business for over five generations the Holbert family have been growing and distributing their award winning oysters to local restaurants and seafood outlets, around the Port Stephens area. During recent years Holberts Oysters has expanded considerable to be one of, if not the biggest processor of oysters in NSW. This expansion sees their product sent, not only locally but right throughout the state, interstate and export markets. A key to their expansion was the opening of the new waterfront factory outlet, located on the shores of Cromarty Bay. The new premises have been designed with customer needs in mind. A large shop front with a vast array of freshly shucked oysters and other local seafood is available. We are also fully licensed, and carry a range of premium Beers and Wines. BYO Wine only. The customer can view through large windows the professional oyster shuckers at work, then take their purchase away or eat alfresco style on site looking over the stunning views of Port Stephens.